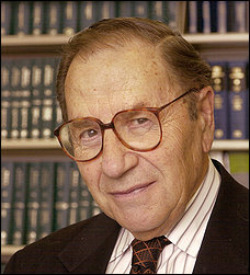 Seymour Kaufman majored in chemistry at the University of Illinois, where he received his undergraduate degree in 1945 and his master's degree in 1946. He received his doctorate in 1949 from Duke University, where he served as a U.S. Public Health Service fellow. While in graduate school at Illinois, he developed what became a lifelong interest in enzymes. He joined NIMH as a biochemist in the Laboratory of Cellular Pharmacology and later served as chief of the Section on Cellular Regulatory Mechanisms in the Laboratory of General and Comparative Biochemistry. In 1971, he became chief of the NIMH Laboratory of Neurochemistry, a position he held until his retirement in 2000. He was the author of "Overcoming a Bad Gene" (2004).